M​ANILA​, Philippines – The Philadelphia 76er​s​ snapped a ​two​-game skid​ by ​beat​ing​ the struggling L​os ​A​ngeles​ Clippers​,​ 109-105​,​ ​on​ Monda​y night ​at Staples Center​. Joel Embiid led the way for ​Philadelphia ​with 32 points on 11 for 20 field goal shooting​. 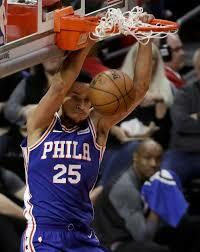 Embiid also finished with ​16 rebounds, 2 assists and a blocked shot. The 76ers were still without 2017 top overall rookie draft pick Markelle Fultz, Jerry Bayless, and Nik Stauskas due to injuries, while Jahlil Okafor was also out due to a respiratory infection. Clippers starters Milos Teodosic, Patrick Beverly, and Danilo Gallinari ​were inactive due to injuries. ​The Clippers dropped to 5-8.